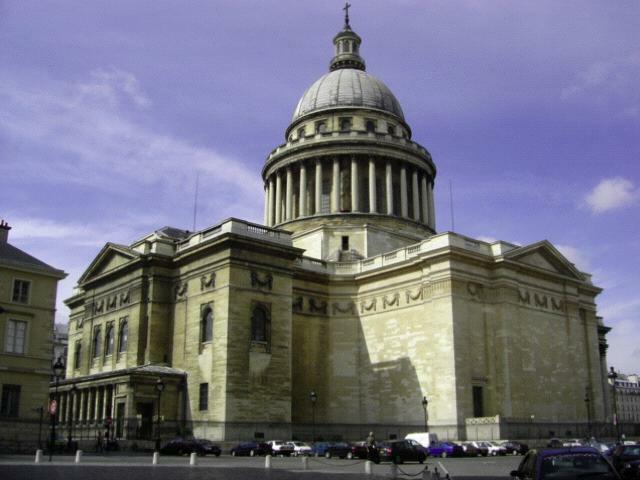 The construction of the Pantheon began in 1758, directed by architect Jacques Germain Soufflot (1713-1780). It was built to be a church dedicated to St. Genevieve, the patron saint of Paris, on the same site as the then standing, though falling into ruins, Abbey of St. Genevieve. Its construction was ordered by Louis XV after he had recovered from a near fatal illness in 1744. The Pantheon sits atop Mont Sainte Geneviève, in the Latin Quarter, and is one of the more noticeable landmarks of Paris. It stands next to the church of Saint Etienne du Mont. Following Sufflot's death, the building was completed by Jean Baptiste Rondelet in 1789. An inscription above the entrance reads "Aux Grandes Hommes La Patrie Reconnaisante", "To Its Great Men The Grateful Homeland". There is also a sculpture in bas-relief by David d'Anger. It is built in the style of Neoclassicism, the first in Paris, which breaks from the rococo style and the baroque, emphasizing simplicity and grandeur. It set the standard for other monuments built in the same style such as the Arc de Triomphe and the church La Madeleine. The Pantheon in Paris is modeled after the Pantheon in Rome, as well as St. Paul's cathedral in London, and is in the shape of a Greek Cross. Its façade is that of a Greek temple and is distinguished with 18 Corinthian columns. The building itself is 110 meters in length (350 feet), 84 meters wide (270 feet) and 83 meters high (270 feet). The interior of the dome is decorated with a fresco, "Assumption of St. Genevieve" (1811). The walls have frescoes by Puvis de Chavannes depicting the life of Sainte Geneviève and frescoes of Charlemagne, Louis IX and Joan of Arc. In 1806, Napoleon gave the building back to the Church. From 1831 to 1852, it was again property of the State. Then, again a place of worship before being finally being returned as a public building in 1885. On February 3, 1851, Leon Foucault first publicly exhibited his now famous Foucault Pendulum in the Observatoire de Paris. Prince Louis Napoleon, the future Napoleon III, asked for another demonstration on March 26, 1851, to be presented in the Pantheon. This revolutionary demonstration provided the proof, and still does, that the earth does, in fact, spin on its axis. Since 1855, Foucault's Pendulum has been hanging and swinging in the Conservatoire des Arts et Métiers. During the recent renovation of this building, the 67 meter Pendulum had a temporary home in the Pantheon. It has since returned to the Musée des Arts et Métiers where it can be viewed. The most recent entombment into the Pantheon was that of Alexandre Dumas (1802-1870). It took place on November 30, 2002. His remains had been transported from his original burial grounds in Aisne, France. The Panthéon is open every day from 10 a.m.-6:30 p.m. The last entrance is at 5:45 p.m. The last entrance for the Upper Level is 5:15 p.m. The last entrance for the Crypt is 6:10 p.m. Admission Fees are:7.50 euros for adults; 4.80 euros for those between 18-25 years of age; free for those under 18 years of age. There are 206 steps to climb to the Upper Level, making an elevation change of 35 meters.